This post is brought to you by Kalamazoo Smiles. It doesn’t get better than having time off to relax, enjoy time with family, and bask in one of the most enchanted seasons of the year, no matter which holiday you celebrate. Kids start bouncing off the walls, you need to get them out of the house, and you’re fresh out of ideas. 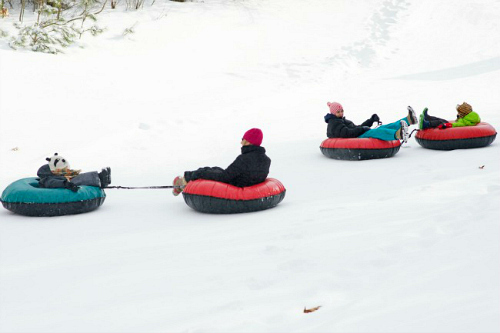 Where to take the kids sledding or tubing? What library programs are happening over break? We are here to the rescue with 40+ boredom-smashing activities and ideas to make the most out of your winter break. The guide is broken down into outdoor excursions, indoor play, cool discovery events, and road trip options. Ice Skate at Millennium Park, Wings West, or at Lawson Ice Arena at WMU. Go skiing or snowboarding at Timber Ridge or Bittersweet. Try out a toboggan run or get tubular at Echo Valley. Check their website for operating times. Bundle up and head to one of Kalamazoo’s great sledding hills. Grab those cross-country skis and glide through one of the beautiful trails in the area. Hop aboard the Holly Jolley Trolley around Downtown Kalamazoo. It’s free and runs through December 31. Drive a little bit west to St. Joe and stroll through over one million twinkling lights at Light Up the Bluff. Head out to one of the Lake Michigan beaches to see what the beach looks like at winter. Often the piers have the most beautiful ice formations. Dine at a new restaurant where the kids can eat for free (or nearly free) with our huge Kids Eat Free guide. Take in a hockey game with the Kalamazoo Wings. Check out their full promotional schedule here. Warm up and see a movie at Kalamazoo 10 or Celebration Cinema movie theaters. Climb, slide, and bounce the day away at Jungle Joes. Try your hand at rollerskating with the kids at Rollerworld. Kids climbing the walls at home? Take them out to Climb Kalamazoo for some real walls to climb. Jump, bounce, and work off that excess energy at Kalamazoo Sky Zone. Craigs Cruisers in Wyoming is less than an hour drive away and offers indoor fun – go-karts, trampolines, and the cruiser coaster. Visit Klassic Arcade in Gobles to relive all of your favorite arcade and pinball games. Head over to Family Fun Time at the Allegan Aquatic Center on Wednesday or Thursday from 11:00 AM – 12:00 PM and enjoy their indoor pool, lazy river, and their slide. Create a work of art at Art Bayou. Try your hand at candle making with the Kalamazoo Candle Company’s new Kids Day Out on Tuesdays. Fly through the air in the Balloon Race ride at the Air Zoo and explore all of the great airplanes and spacecraft for an “out of this world” experience. Check out the Air Zoo: Five Fun Ways to Play article for ideas. Take in a planetarium show at the Kalamazoo Valley Museum. There’s a ton of winter ones to choose from, including the all-ages “Let it Snow” with classic Christmas music on Saturdays. Try out somewhere new to stay toasty and warm in our Ultimate Guide to Indoor Play in Kalamazoo. Curiouser and curiouser! Bring the family to play flamingo croquet and meet Alice and her friends. Wonderland runs December 26 – January 17 (fee applies). Every Wednesday through Friday, from 11:00 AM – 3:00 PM, come to the Air Zoo for winter break fun – no space suits or snowsuits required. Each session will feature new, themed activities for the whole family to enjoy. COST OF ENTRY: General admission plus $2 or just $2 total for Air Zoo members. Head to the museum to take a look at just a few of these animals that lived through an ice age. Step back into time with crafts on woolly mammoths, sloths, saber-toothed tigers and more. 3rd through 5th graders can make a no-sew pillow snowman to snuggle. Two sessions offered. Registration required. The sisters Samadhi and Poojani Attanayake along with Susan Iervolina will show families how to dance away the dark days of winter with Kaho Dance of Light. Test out your Superhero fitness and dance moves at this energetic session present by Wellspring. Best for grades 3-5. Registration required. Register for a 30-minute session to work besides a Kalamazoo Scale Model mentor as you create a model of your choice to take home. Teens and tweens can learn how to make their very own handmade soap. Teens and tweens can join illustrator Corinne Roberts and learn how to draw fantasy creatures. Rootead Queens will teach teens and tweens self-care techniques and practices including pedicures, making lotions and potions, yoga, dance, and delicious snacks. Multiple sessions. Registration required. See African folktales brought to life in this one-woman show which is perfect for families and encourages audience participation. Registration required. Drop in at the Visitor Center for different programs and activities each day. A Naturalist will be on hand to encourage exploration and assist with the fun. A children’s program will take place each day at 11:00 AM and an all ages program at 2:00 PM. Percussion instruments from all over the world will be used in this fully audience-interactive community drumming experience. Registration required. Ituha Cloud brings to life this classic family favorite with lots of interaction and audience participation. Learn how to create conga and bongo Latin rhythms at this hands-on music program. Best for grades K-5. Registration required. Experience the joy of Christmas Traditions Around the World at Meijer Gardens and Sculpture Park. Head to Holiday Nights in Greenfield Village, December 26th or 27th to enjoy Santa and his reindeer, ice skating, carolers, artisan demonstrations, crafts, cooking demonstrations, and beautiful decorations. The night ends with fireworks. Discover Avalanche Bay Indoor Waterpark rated “one of America’s Coolest Indoor Water Parks” for a great day of family fun. Day passes available. Consider one of these Fun Indoor Play Places Outside of Kalamazoo.